Across the U.S., we’ve hit the dog days of summer. Most regions are now seeing their hottest temperatures of the year, and the combination of heat and high humidity sends most people running for a cold drink, some shade, or an air conditioner. 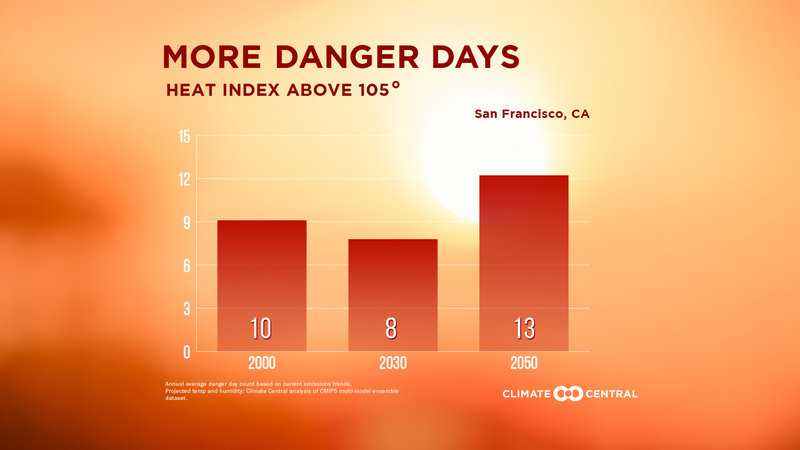 Heat is the No.1 weather related killer, and as carbon pollution continues, global temperatures will keep climbing, bringing hotter summers and more extreme and dangerous heat. Climate Central's States at Risk project analyzed historic trends in summer temperatures since 1970 as well as projections for future extreme heat for hundreds of metro areas across the lower 48 states. Using several measures, our findings show that most U.S. cities have already experienced large increases in extreme summer heat and absolute humidity, which together can cause serious heat-related health problems. The hottest parts of the country, including Texas, the Southwest, and Florida have already experienced large increases in extreme heat days, including days over 90°F, 95°F, and 100°F, as well as rising levels of humidity that make hot days feel miserable and extremely hot days downright dangerous. Cities in those same states are facing the biggest projected increases in dangerous heat over the next several decades. Florida faces by far the greatest increase in the dangerous combination of heat and humidity over the next several decades. The 13 metro areas in the U.S. projected to see the greatest increase in danger days by 2050, are all in Florida. 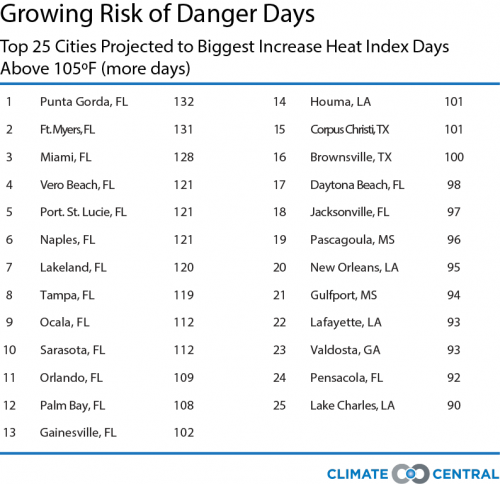 Every one of these cities is projected to see an increase of more than 100 dangerous heat days — when the heat index, a combination of heat and humidity, is more than 104°F — by that time. This will only accelerate changes already seen in Florida, where Miami tops the nation with the greatest increase in annual average 90oF days per year since 1970 with 46 more such days. 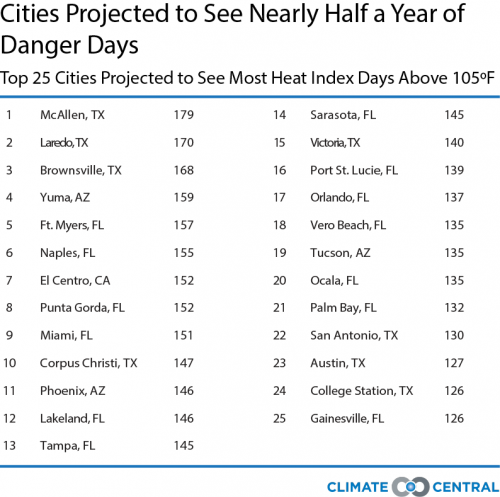 McAllen, Texas is second, with 26, followed by Tucson with 25. Texas tops the nation in extreme heat, with 6 of the top 7 cities with the greatest increase in 95°F days, including Austin, San Antonio, and Corpus Christi. In addition, three Texas cities lead the nation in projected danger days by 2050. 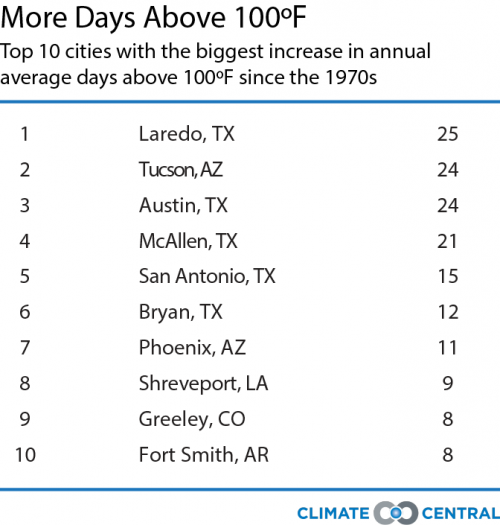 Nearly half the year, between 168 and 179 days, will be what the National Weather Service considers dangerous heat days by 2050 in McAllen, Laredo, and Brownsville-Harlingen. Arizona is also hard hit, with Phoenix projected to see 146 danger days by 2050, Tucson expected to see 135, and Yuma projected to have 159. As a harbinger of these changes, Tucson now has 24 more days above 100°F on average per year than in the 1970s, the second largest increase in the nation. This deadly risk is not likely to go away. By the end of the century, heat-related deaths are projected to increase by thousands to tens-of-thousands each year in the U.S.5 Those most at risk of heat-related health impacts are infants and young children, elderly over 65, those already ill, athletes, and outdoor workers2. But everyone is potentially at risk. Elevated heat, especially along with high humidity, makes it difficult for the body to cool itself. In addition to increasing the risk of mortality, heat can cause problems throughout the body. It can range from dehydration, cramps, exhaustion, dizziness, vomiting and heat rash to more serious issues involving kidney failure, heart issues, and exacerbation of respiratory issues6,7. These heat impacts also provide a challenge to the healthcare industry with increased hospitalizations and doctors’ visits and insurance claims. High heat also impacts other sectors and infrastructure. Stagnant air often occurs during periods of elevated heat and allows dangerous levels of air pollutants to build up. High temperatures also directly provide conditions conducive for producing harmful ground-level ozone. Periods of extreme heat can wither crops and exacerbate drought conditions greatly impacting agriculture. 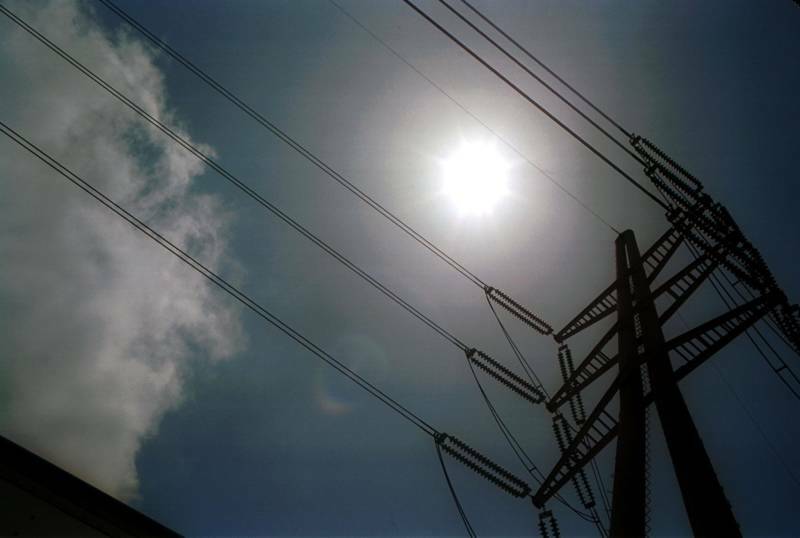 Blackouts often accompany heat-waves as the need for cooling puts a heavy strain on the power grid. Heat waves can also lead to harmful algal blooms and promote other bacterial growth in bodies of water and lead to degraded fish habitat, such as for species that require cooler streams and rivers. The combination of hot temperatures and high humidity create dangerous conditions for humans. The National Weather Service defines as dangerous any day when the heat index (the combination of heat and humidity, commonly known as the “feels like temperature”) exceeds 104°F. Under these conditions, sunstroke and heat exhaustion are likely, and physical activity or being outside for long periods is risky, potentially leading to heat stroke. These dangerous heat days pose the greatest threat to kids and the elderly, and to people who don’t have easy access to air conditioning. We analyzed 360 of the biggest U.S. cities to see how the average number of danger days is projected to increase in the coming decades. The projections draw on 29 global climate models that have been downscaled across the continental U.S. to represent local climate conditions. Even in the absence of high humidity, extremely hot days pose a considerable health threat, particularly under prolonged exposure. Across most of the U.S. temperatures have increasingly been exceeding 90°F, 95°F, and 100°F since 1970. Our analysis of trends in extreme heat days is based on annual counts of 90°F, 95°F, and 100°F exceedances in the country’s largest 200 cities. 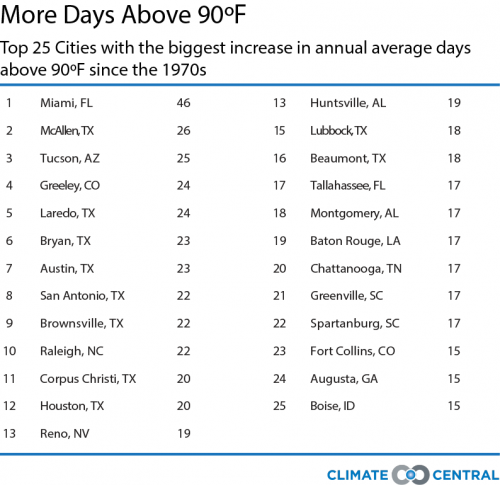 The hottest cities are seeing the biggest average increases in extreme heat days, in general. 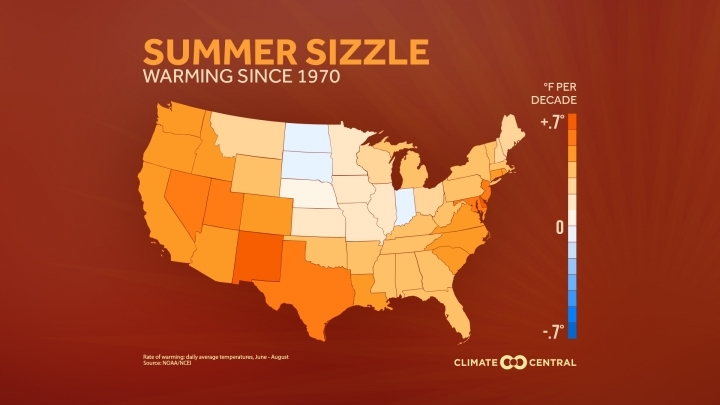 Since 1970, summers have been warming in 45 of the lower 48 states. 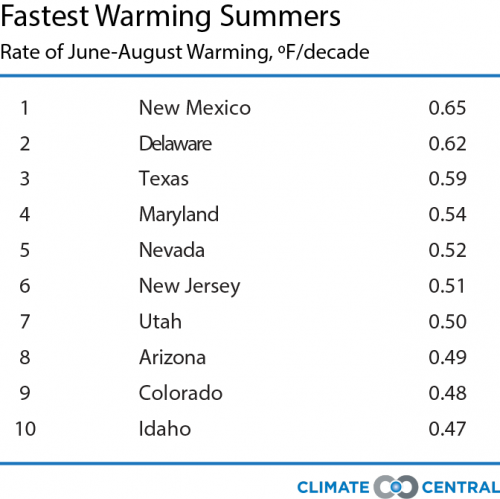 In many of these states, this warming is driven largely by nighttime temperatures getting hotter. As temperatures rise, evaporation increases, causing increased water vapor in the air. That extra moisture makes the air feel muggier, and can make it a lot more difficult to tolerate the heat because our bodies have a harder time keeping cool through perspiration. As summers warm across the country from increasing greenhouse gases, cities are also getting sticker. 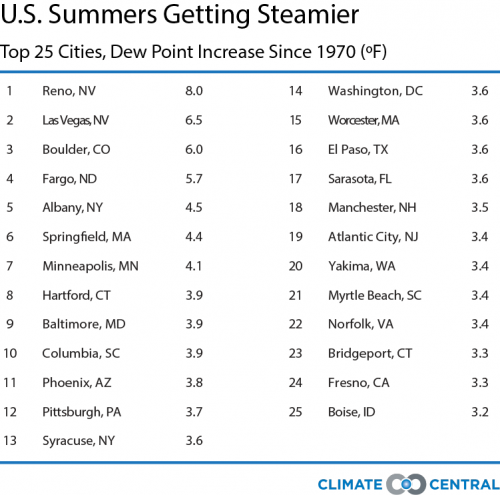 Climate Central analyzed how the average summer dew point has changed in 200 major U.S. cities since 1970 (the dew point is a measure of how much moisture is in the air). We found that 87 percent of those cities have experienced an overall increase in their average summer dew point over the past 46 years, indicating that there is typically more moisture in the air on hot summer days now than there used to be. Analysis by Alyson Kenward, PhD, Jennifer Brady, James Bronzan and Todd Sanford. Read full methodology. 1. Harvard Medical School (2005), Climate Change Futures: Health, Ecological and Economic Dimensions, Cambridge, MA: The Center for Health and the Global Environment, Harvard Medical School. 3. Palecki et al. (2001), Bulletin of the American Meteorological Society. The Nature and Impacts of the July 1999 Heat Wave in the Midwestern United States: Learning From the Lessons of 1995. 82:7, 1353. 4. Semenza et al. (1999), Am. J. Preventive Med. Excessive Hospitalizations During the July 1995 Heat Wave in Chicago. 16:4, 269. 5. U.S. Global Change Research Program (2016), The Impacts of Climate Change on Human Health in the United States: A Scientific Assessment. 6. Becker, J.A. and L.K. Stewart (2011), American Family Physician. Heat-related illness. 83:11, 1325. 7. Glazer, J.L. (2005), American Family Physician. Management of Heatstroke and Heat Exhaustion. 71:11, 2133.